Home Beers Witch's Hat Brewing Co.
Night Fury - Bourbon Barrel-Aged Traxxx | Witch's Hat Brewing Co. Bourbon barrel aged Night Fury Imperial stout aged on Vanilla beans, Mindo cocoa nibs, coconut and peanut butter. Pour: Pours straight black with one finger tan head which dissipates fairly quickly. Nose: The nose on this beer is awesome! Smell's like graham cracker, chocolate, coconut, and marshmallow. Smells sweet but balanced with the graham cracker taking the lead. Reminds me of the smell of a Smore. Taste: Great, but underwhelming at the same time. I think the nose hypes this up too much for me. Get the vanilla and graham cracker up front. It lends way to chocolate and bitterness towards the tail. Coconut comes along with the bitterness on the tail end. Get a bit of peanut butter towards the end as well. Overall a lot of layers going on here and well put together. Reminds me of Nutulhu with the flavors at play, but more balanced as the booze are blended in with the Trax better. Sweetness and booze towards the tail make it pick up like a dessert beer. Balances out better as it warms, but just doesn't quiet pop like the scent does. Overall: Great beer that I look forward to having again. A bit sweet, but still well rounded and prefer it over Nutulhu which has a fairly big booze pickup at the end. Although, I should do these two side by side to truly say that and am just going off past notes. Definitely in top tier with the flavor profile. Not at KBBS level for me, but I'd put it in the Assassin, DBH, BA Abraxas arena personally. A bit better mouth-feel and possibly higher than those, but as drank in the same ballpark or slightly lower. I'll be doing this side by side with the likes of those mentioned above PVW BM, Puga Royale, and similar in a couple weeks. Look forward to seeing them all next to each other for a closer comparison. Definitely looking forward to what comes out of Witch's Hat down the line. They've put together a solid beer here and expect more great things in the future. This is one of the most interesting and mind blowing stout I have had. There are sooo many layers of flavor in this stout, and to me, it stands alone in it's own category. The peanut butter flavor and notes are phenomenal, and the subtle coconut comes through on the backside. A slight bitterness of the base Night Fury stout keeps this from being sticky or overly sweet. No cloying taste at all. Just LOVELY. I am going to start by saying that after all the attention this gets on the trade forums I was really excited to try this and boy was I disappointed! It poured jet black but right off the bat, I could tell it was a thinner viscosity then I like. It smelled of bourbon, chocolate, roast, and caramel. I had goosebumps from that and was eager as hell to drink it! My first sip was reminiscent of my first childhood disappointment. There was coffee roast flavor, followed by a hint of chocolate, then oak and a bunch of booze. There was no peanut butter, vanilla, or coconut. The body of the beer was so thin it was like drinking a porter. The hype this beer is getting makes me feel happy for my homebrew friends here in FL. Maybe I'm jaded for living in FL and getting CCB and cycle stouts. Maybe Im just pitting everything against &+ which actually made me think about what I was drinking. This beer Falls short so bad! My heart goes out to all the people that traded big hitter beers for this brown turd of a whale. Tasted at the MI summer beer fest in Ypsi. Reviewed from notes. Black bodied beer with small khaki head. Smells of loads of peanut butter and that is really about all. It still smells pretty nice. Tastes of peanut butter, chocolate, caramel and booze. Mouthfeel is thin for a barrel aged stout and it is pretty boozey as well. Medium bodied with low carbonation. Beware of the hype monster! This beer is pretty rare, but it is not nearly as good as the night fury variants last year at the same beer festival. This year they are boozy and thin compared to last years batches. It is honestly like night and day. 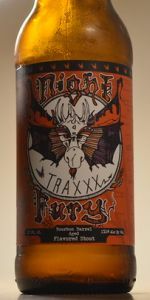 The dragontrax was my first sample of the festival and several of the other variants were better, but sadly disappointing to report that over all; every night fury variant was thin a boozy with minimal barrel notes this year. Stop with all the hype-train. We drank this last night and it was too many adjuncts to try and "taste" peanut butter or chocolate. It was a mess and the beer was incredibly unblended, it was super hot with alcohol. Pretty dark body with no legs. We were able to start this cold and let it warm up and still, we would kind of get whifs of burnt peanut butter but the taste was as if it was a homebrewed imperial stout. I am sorry for everyone who has traded big dogs for this beer. It was not worth it, at all. Tastes like a bourbon soaked, liquified peanut butter chocolate chip, coconut cookie. Find it best fresh but aged 6 months still tasted delicious. Found bourbon to be more forward with peanut butter taking a back seat when aged but fresh the peanut butter is in your face. Just so damn delicious! Consumed On Tap @ Michigan Summer Beer Fest, and Fury of a Feast 2014. Look: Midnight black, minimal tan head. Smell: Peanut butter bomb. Chocolate. A bit of oak. Taste: Huge peanut butter, hints of chocolate, oak, and bourbon. A perfect dessert beer that would go great with ice cream. Feel: Lightly carbed, the peanut butter really smoothes out the mouthfeel. Not as thick as something like Zhukov, but not thin by any means. Overall: A truly unique stout that isn't like anything I've ever tasted. Look-Jet black with a thin residual halo of beige bubbles hugging the glass. Almost no visual carbonation. Pretty sure you could see your reflection in it. Smell- Pure Dessert. Sweet vanilla Bourbon spiciness gets quickly overrun by the sweet candy elements. Roasty peanuts, burnt dark chocolate, milk chocolate, praline, caramel, toasted coconut, sweet vanilla. Like huffing a box of Girl Scout Samoas and Tagalongs at the same time. Taste- Milk chocolate bourbon ball, bittersweet dark chocolate notes, roasty chicory coffee, vanilla creme, peanut brittle, zagnut bar, more milk chocolate, roasty caramel and chocolate malt sugar. Feel-Thick and viscous, but with all of the flavors present, it leaves you wishing it was a bit thicker than it is. It would be nicer for the flavors to linger a little longer with a heavier mouthcoat. Overall- Damn near perfect. Otherworldly brew from Witch's Hat. This could be HUGE in a few years with the local buzz surrounding it. Hands down one of the tastiest beers I've ever drank. Small pour of the late 2015 release, served in a minisnifter. Pours a dark black body, half finger offwhite head, minimal retention time, no lacing. Smells of whiskey, oak, chocolate, a bit of espresso, caramel and not much else. None of the adjuncts came out, even after waiting the sample to warm up a bit. I found that to be odd. Flavour is similar; not much to write home about, very clean, solid whiskey flavour, oak, dark chocolate, small amount of roast, caramel. Again, no significant adjunct presence. There's supposed to be peanut butter in this, but at most, I could say there is a small bit of nuttiness if I look for it. I certainly didn't find any before I looked this beer up. Same for the coconut, vanilla, et al. Mouthfeel is medium bodied, lower carbonation as expected, a bit of warming heat. Overall, a bit of a disappointment, but in keeping with what the other reviewers are saying about this beer. I'll have to try this again another time. Re-review: Batch 1, served in a minisnifter glass 4/30/2016. It's not too different than what I found above; no real nuttiness to it that would indicate the presence of peanut butter. Solid bourbon presence, chocolate as well, good body, mild heat. Classic example in my opinion of "sounds better than it tastes" I caught a little of the barrel in this beer, but not in a sweet raisin aspect, more of a woody dominant flavor. After that, I did not pick up a single adjunct. Night Fury - Bourbon Barrel-Aged Traxxx from Witch's Hat Brewing Co.